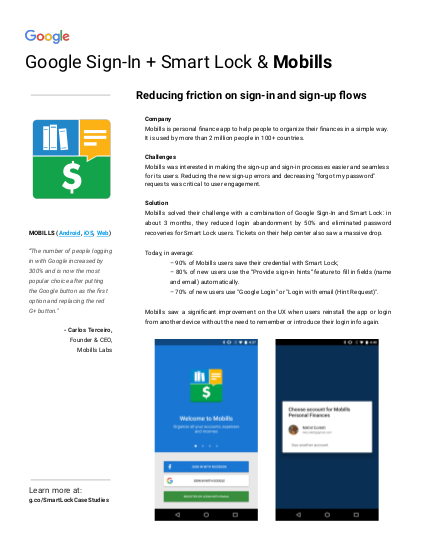 With Smart Lock for Passwords, you get frictionless sign-in and sign-up into apps on Android and sites in Chrome with any account. Users will get automatically signed-in across devices. In turn, you reduce the risk of forgotten user passwords and missed conversion opportunities when users get frustrated trying to sign in or move on to another activity. Once your user saves a password to Smart Lock, they can skip entering their credentials on all of their Chrome and Android devices. 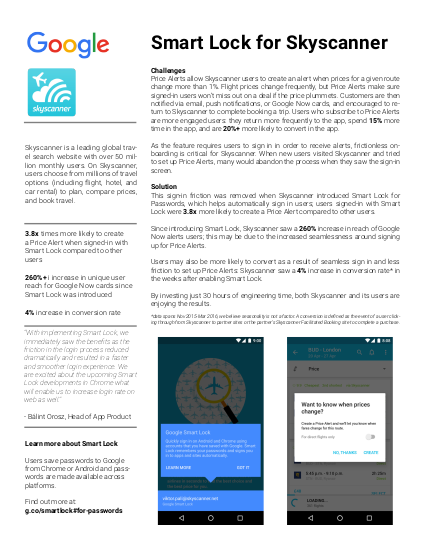 Here are success stories of some early adopters of Smart Lock for Passwords. HotelTonight saw a 23% higher conversion rate for Smart Lock users, compared to email address sign-ups. Read about their experience implementing Smart Lock for Passwords on their blog, Build Tonight. Netflix was able to implement Smart Lock for Passwords in just a matter of days. 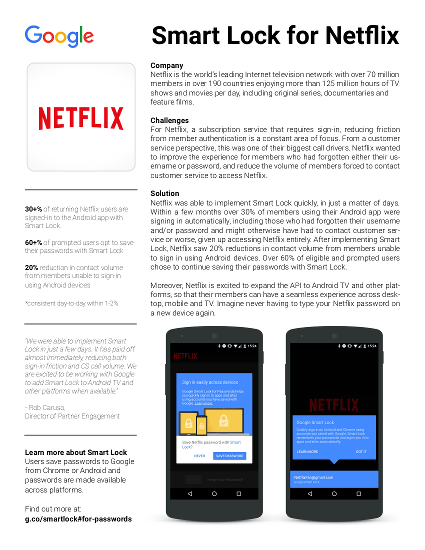 Within a few months, Netflix saw 20% reductions in contact volume from members unable to sign in using Android devices. 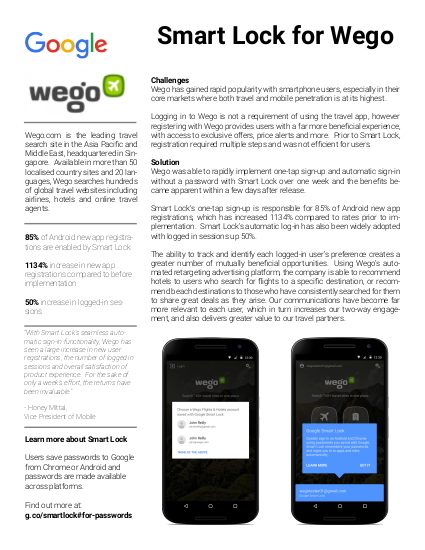 Smart Lock's one-tap sign-up is responsible for 85% of Wego's new app registrations on Android, which has increased 1134% compared to rates prior to implementation. Smart Lock's automatic sign-in has also been widely adopted, with signed-in sessions up 50%. Users may also be more likely to convert as a result of seamless sign-in and less friction to set up Price Alerts: Skyscanner saw a 4% increase in conversion rate in the weeks after enabling Smart Lock. AliExpress has seen an 85% drop in sign-in failure rate with Smart Lock. 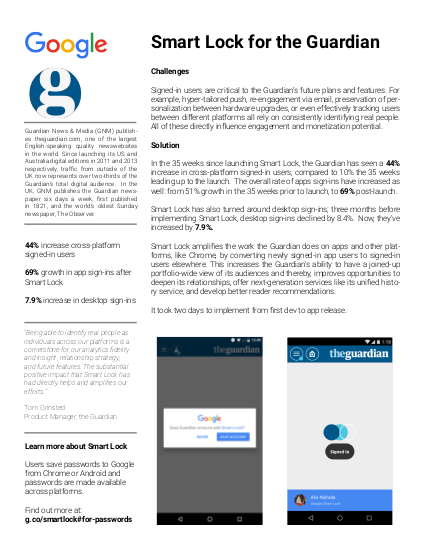 The Guardian has seen a 44% increase cross-platform signed-in users with Smart Lock. 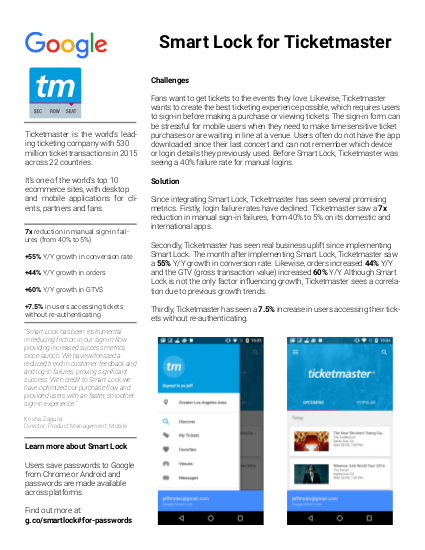 Ticketmaster saw a 7x reduction in manual sign-in failures, from 40% to 5% on its domestic and international apps. 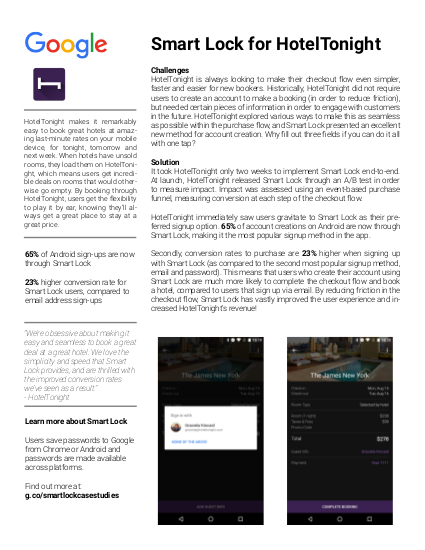 In about 3 months after integrating Smart Lock for Passwords, Mobills (Android, iOS, Web) reduced login abandonment by 50% and eliminated password recoveries for Smart Lock users. Ticket volume in their help center also saw a massive drop. The New York Times has seen 80% of their new sign-in events assisted by Smart Lock for Passwords. LinkedIn saw up to 10% increase in successful sign-ins for existing members and up to 15% increase in successful new member registrations when using Smart Lock. Komoot saw a 19% increase in sign-up conversion with Smart Lock in an A/B test. The percentage of Zillow's daily signed in users increased by 10.6% and registrations increased by 27% after integrating Smart Lock for Passwords. Read more about Zillow's experience implementing Smart Lock for Passwords on the Zillow Engineering blog. Due to Smart Lock's email selector, new Glow users don't need to input email address manually, which helped increase the sign-up rate by 5%. Additionally, this sign-up process helped lower user error from forgotten emails/passwords and resets by 10%. 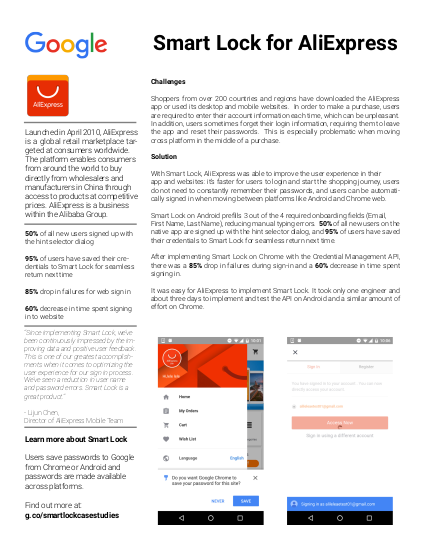 Shortly after launch, Smart Lock drives 10% of Gumtree sign-ins, for a 10% improvement in overall sign-in rates. Todoist noticed 80% more sign-ups in an A/B test that integrated email suggestions from Smart Lock hints. This increased conversion from download to sign up by around 6-7%.